Call Now For All Your Prescription Needs! We Carry a Wide Array of Durable Medical Equipment! Call Us So We Can Help! For the past 63 years, Davila Pharmacy has gained the trust of the San Antonio community by providing the highest level of care for all our patients. We have grown from a small neighborhood drug store to a full service, modern pharmacy offering traditional and non-traditional services. For more than 50 years, we have remained a family owned, independent business. Davila Pharmacy bills Medicare, Medicaid, and other third party insurance companies for both prescriptions and medical supplies. We are dedicated to serving you to the best of our ability. 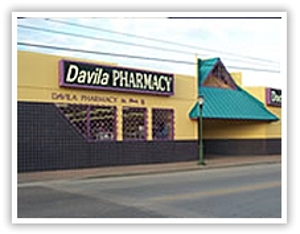 Contact Davila Pharmacy today so we can help you with any of your pharmacy needs! Speak with a Pharmacist! Call Now! Copyright © 2018 davilapharmacy.info All rights reserved.